the components you need for Increased Energy and Better Health. Your intestinal system processes food into nutrients for the energy you need. Keeping your intestinal system clean and healthy through cleansing guarantees you all the energy you need. With the Master Cleanse waste that has been stuck in your colon will be removed, giving you a flatter belly. You will also feel the benefits of better hydration and increased nutrition and mineralization. Throughout the country thousands of people have done the Master Cleanse Program and will say that it really does work! They will tell you that the Master Cleanse (or the Lemonade Diet) is the fastest and most effective way to regain your vitality and to feel the joy of living again. As an added bonus, it will help you lose weight and give you more energy each day. 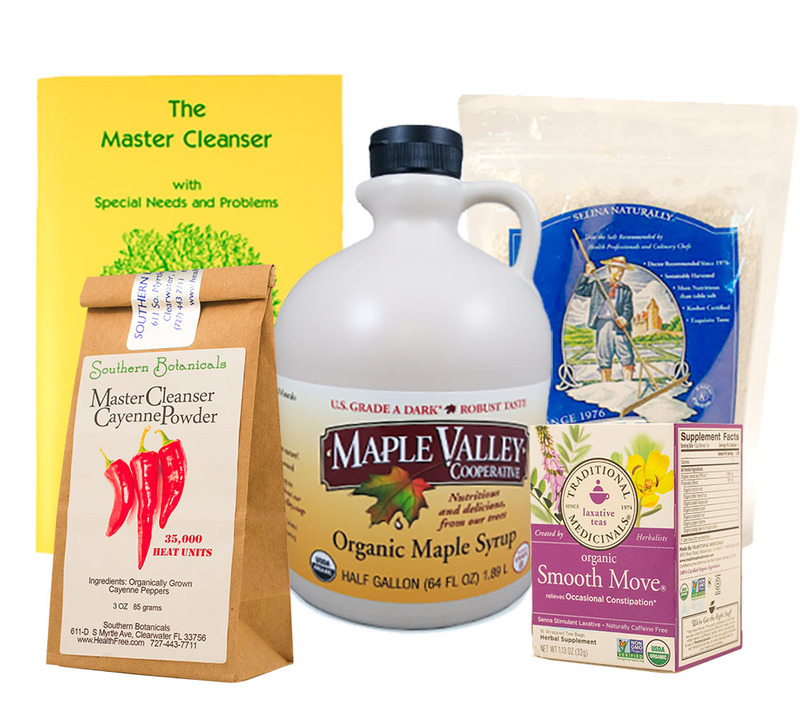 Our Master Cleanse Kit is a great savings over most others available on the market! Maple Syrup, organic, dark mineral rich grade - 64 oz. Light Grey Celtic Sea Salt - 1 lb. Stanley Burroughs developed the lemonade juice diet as a liquid mono-diet that produces a detoxifying and cleansing effect to the body. Based on his medical observations, Burroughs saw that the lemonade diet aids the stimulation of healthy tissue growth. Burroughs' "Master Cleanse", also known as the Lemonade Diet, was originally intended as a new and more effective method to treat ulcers. A pioneer of alternative medicine, Stanley Burroughs is also known for his other classic alternative medical text, Healing for the Age of Enlightenment. The Stanley Burroughs' Lemonade Diet is a dietary program that should be followed for at least ten days and can be performed for forty days or more. Unlike other diets, the Burroughs' Master Cleanse is not designed primarily for weight loss, but for body cleansing. Also known as the Lemonade Fast, the Lemonade Diet is recommended for individuals who are suffering from a serious medical condition. Although the Lemonade Fast is sometimes viewed with skepticism in the medical community, tens thousands of users of this treatment in the last several decades vouch for its validity.